Decorate a bulletin board easily! I love to make bulletin boards. I am always looking for new ways to showcase student work. Recently, I stumbled across PosteRazor, which is FREE software that transforms any image into poster size. It is a great tool you can use to enlarge student work to make it stand out. It also offers a super way to create a decorative image that makes your display even more eye-catching. PosteRazor divides the image into sections in a grid pattern. The sections are paper sized. Each piece of paper has an enlarged version of part of the image. The software then converts the new file to PDF format. You then open the file using Adobe Reader and print it. Afterwards, you trim the edges and glue or tape each piece of paper together to form ONE LARGE IMAGE! Watch the video to see how easy it is to use! Select your paper size and the orientation (portrait or landscape). Review the overlap size, which is the area of the page you will use to glue or tape the pages together. Select the number of pages that the image should span. The program will then divide the image into sections. Save the poster as a PDF file. 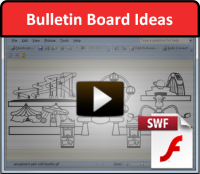 Print the PDF file and assemble it together to form a fantastic image for your bulletin board.